ANDY’S PICK :: INHUMANS TP: ORIGIN OF INHUMANS: In 1965, Stan Lee and Jack Kirby created a group of supporting characters that cemented the Fantastic Four’s place as The World’s Greatest Comic Magazine!. 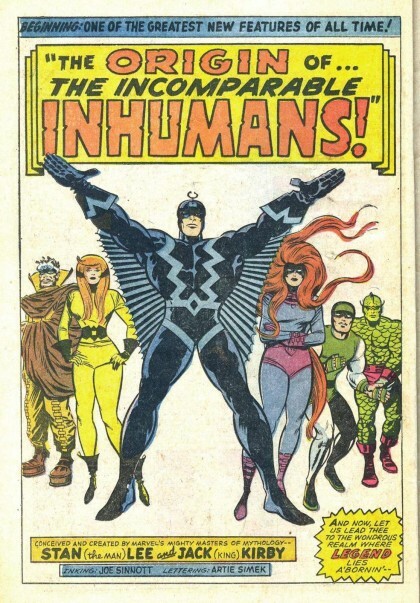 These Inhumans– a group of Earth-based Kree who are exposed the Terrigen Mists and receive bizarre super powers– continue to play a vital part in the ever-unfolding tapestry of the Marvel comics Universe to this very day. Read the earliest adventures of the Inhuman’s Royal Family– Black Bolt, Medusa, Trigon, Karnak, Gorgon, Crystal along with their faithful teleporting dog Lockjaw! See Kirby at one of his many creative peaks aided and abetted by (arguably) his greatest inker, Joe Sinnott!, Read captions filled with the Stan Lee ’60s Marvel Magic! See what all the exclamation points are all about!!!! Collecting FANTASTIC FOUR (1961) #36, #38, #41-47, #54, #62-65 and ANNUAL #5, plus portions of #48, #50, #52 and #55-61; and the Inhumans’ origin story serialized in THOR #146-152. ← HEROESCON GUEST LIST UPDATE :: GARNEY! PISKOR! & MORE!